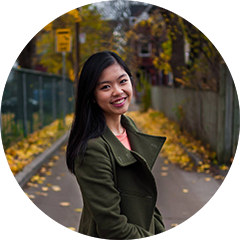 From a young age, Corinna Ha, BCom’19, had a strong social conscience. “Business always bothered me,” she said. “I was aware that some businesses exploit people and resources, and that consumers don’t always know about it.” Corinna knew that she wanted to study international business with a development bent, but, with high grades that would allow her many options, she was faced with a decision: which university would help her achieve her dreams? Corinna was also influenced by the offer of a highly-competitive renewable Marcel A. Desautels Prestige Entrance Scholarship, which has allowed her to focus on her studies and enjoy the rich range of out-of-the-classroom opportunities available through the Faculty. In November, thanks to support from the Faculty and other sponsors, she and six other young Canadians flew to the Philippines to draft a youth declaration and find investment opportunities for Canadian companies at the APEC CEO summit (Prime Minister Justin Trudeau, BA ’94, also attended the summit in Manila, surrounded by screaming crowds). “Sitting in on the discussions was an invaluable experience,” she said. Corinna also hopes to take advantage of other opportunities closer to home. She’s particularly interested in the Social Economy Internship Program in the Faculty’s Marcel Desautels Institute for Integrated Management, which places students with local and international NGOs and charities. “When you go to a university that has invested in you, you have a really good feeling that they’ll keep investing in you,” she said. As any Desautels student could tell you, that’s just good business.